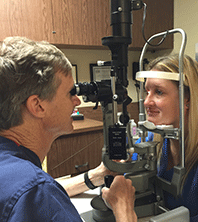 We recommend regular eye examinations to detect vision deficiencies and disease. How often you see the eye doctor depends on your age and stage in life. An eye examination is an evaluation of visual acuity as well as the health of your eyes, and usually includes a glaucoma test and retinal evaluation. A thorough eye exam will detect eye health problems, prevent deteriorating eyesight, and provide a prescription if corrective or contact lenses are needed for reading, distance, computer use, or any combination of these.